I saw a small iron this last month that was oriented in a very strange manner. It had a melted lip on both sides. That is an interesting trick. This got me interested in getting out my oriented irons and taking a better look at them. I knew none of them showed anything like that, however they are among my favorite specimens and it had been a while since I had spent any time with them under the microscope. Oriented meteorites have frozen in their shape and surface the record of their fiery passage through the Earth’s atmosphere. All meteorite arrive on the surface of our world by the same experience, but only the rare few that are stable during flight will show the marks of ablation and accumulation. 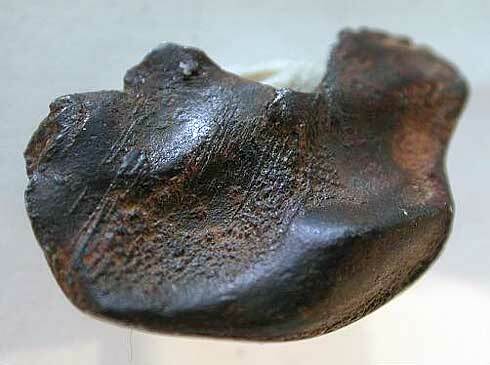 These are the oriented meteorites. Some of these marks are radial flow lines, splattered material clinging to the sides behind the forward surface, and lips and ridges of melted material that has flowed as liquid back from the front. Any type of meteorite can be an oriented one. The material is not what is important. It is the fact that only one surface remains the forward surface during the ablation part of entry flight. There are some very famous oriented stones. 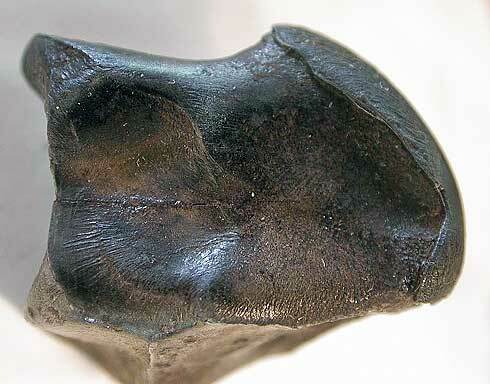 Martin Horejsi shared in this publication last month the Eagle’s Nest oriented meteorite which is a stone type. But, with large numbers of small irons currently available from falls such as Taza, and Sikhote Alin, offer us a portion of their numbers that are oriented. I have spent a good deal of my time at gem shows hunting through trays of these for oriented specimens. Irons seem to be very well suited to preserving the tiniest of detail, better I think than the stony types of meteorites. The following is a photo study of some of these features. 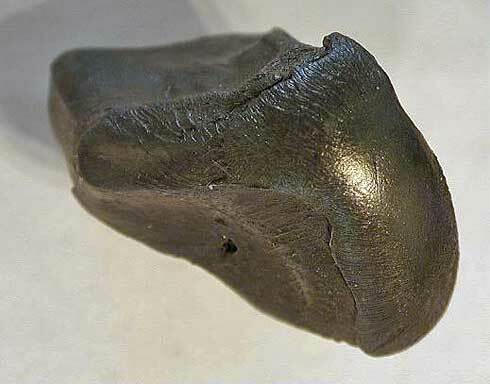 This small Taza specimen show several of the classic features of an oriented meteorite. In the foreground is some splattered molten metal. At the lower right in the far ground is part of the melted lip of metal which accumulated during the ablating period of entry. 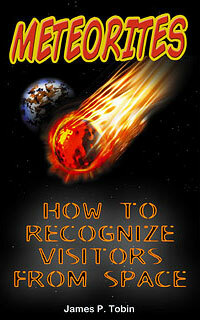 It was not my objective to offer the next meteorite as any replacement for the meteorite of the month. But, it has such special and wonderful orientation features that it well could have been included in that feature some month. Clearly the blunt and heavily lipped surface on the right of the photo was the primary portion ablated. However, the bottom and lower left areas of the photo show classic radiating lines and have formed a lip as well. So though it was stable sort of in flight it appears to have shifted a little ablating two surfaces without destroying the surface marking already created. There were actually several stages of ablation which the next photo will help to demonstrate. I apologize for the lack of sharpness in this picture but what appears to be a rather flat surface is in fact a strongly sloping surface that is impossible to get completely focused. But, you can see the three distinct layers of melted metal that have the appearance of dripped candle wax. Note the hole in the bottom most layer. I have no explanation for this other than that something has eroded out of the spot. The specimen is in nearly pristine condition and is a very nice natural black color. It is one of the freshest looking Sikhote Alins I have. I obtained it within minutes of being pick up from the airport after a flight from Russia. 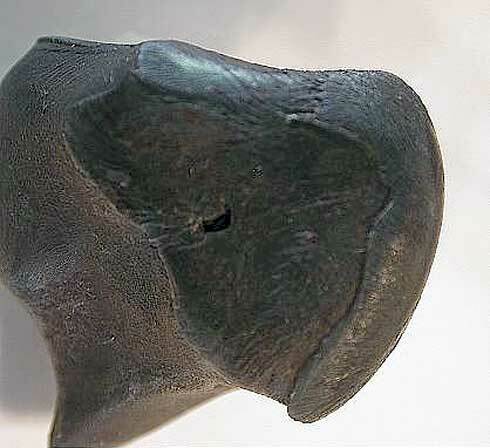 This view of the primary blunt nose is reminiscent of how a lead bullet looks when it has been shot into the ground. But, this is not the result of impact with something hard. Instead it is the result of impact with the atmosphere of the Earth. This shot shows the degree to which the flowing liquid metal has strung back and adhered to the trailing body of the meteorite. 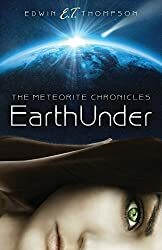 This meteorite causes me to visualize what I think was happening and relate it to everyday life. So I hope you will pardon one last analogy. But, the flowing metal reminds me of the rain running off my car window in small wiggly streams due to air currents as I drive. Not really very different from what has happen with the meteorite. I will leave this last picture to your own investigation. 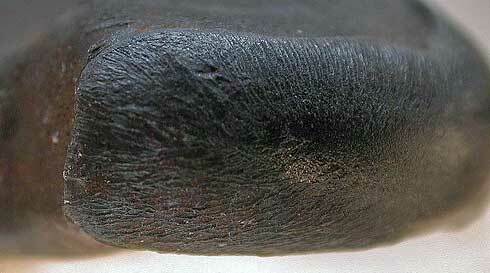 It is of course an even closer view of the radiating lines on the blunt surface. « Irghizites – Crater Glass or Tektites?